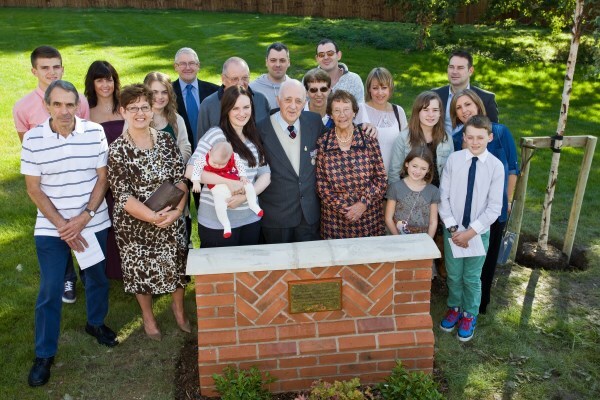 Bovis Homes' Uplands Mill development in Biddulph was proud to play host to a special ceremony honouring local World War Two hero George Gerard Booth DFM. George was a member of the Royal Air Force, which was commemorated by Winston Churchill in his famous speech about the Battle of Britain. The rear gunner with 51 Squadron of Bomber Command flew 31 missions over enemy territory, many over heavily defended targets, and received the Distinguished Flying Medal from King George VI at Buckingham Palace after the war. The 89-year-old now lives with wife Ida next to the new Uplands Mill development where 200 new homes are being built by Bovis Homes. 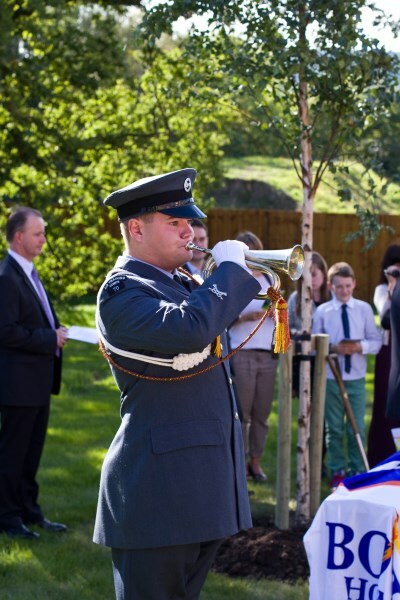 When their regional sales director Lynton Dudgeon, himself an officer in the RAF Volunteer Reserve (Training) branch, heard George's story from his family, he decided something should be done to mark the Biddulph man's courageous military service. Lynton, along with the site manager Craig Galley, sales team leader Kate Burrow and Andrew Willerton the region's landscape architect organised and hosted a special ceremony at Uplands Mill to mark George's bravery. 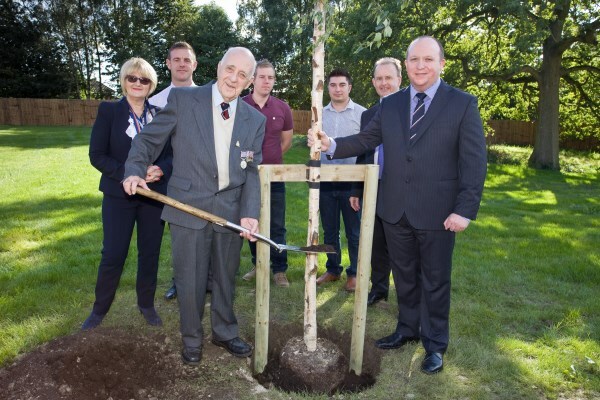 It was attended by family, friends, local residents and members of both 70 (Croft & Culcheth) and 2151 (Biddulph) Squadron Air Cadets, and saw a plaque erected and a silver birch tree planted. "It was a very emotional day and it was a proud moment to have played a part in making a true World War Two hero feel happy and recognised locally for his efforts during those dark days," said Lynton. "They don't make them like George any more and it is only fitting that Uplands Mill, as a new part of the community, should reflect the bravery and service of one of the town's most distinguished residents." The ceremony was attended by four generations of the Booth family and took place on George's 68th wedding anniversary - and Ida's 90th birthday. Ida said: "This is wonderful because George has never shouted about what he did. He is very humble." George has lived in Biddulph all his life and the couple, have four children, 12 grandchildren and 15 great-grandchildren.